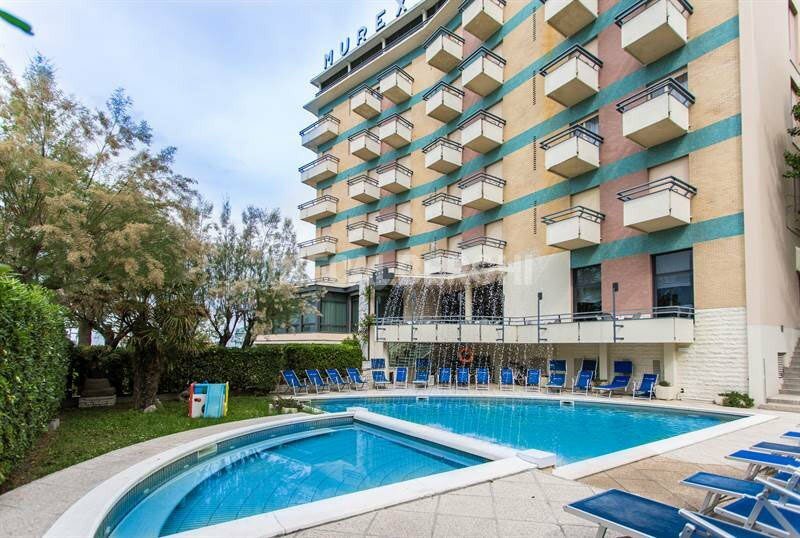 The Hotel Murex , elegant 3-star hotel in Cattolica, has WI-FI, parking and garden with swimming pool. It offers both rooms and apartments. It welcomes pets of all sizes. The hotel is located in Cattolica, in the area of the new marina, a few steps from the beach, near the center and the pedestrian area. The hotel offers 5 types of room: Standard, Classic, Superior, Family room, Apartment. All rooms have a balcony or terrace with panoramic sea views, air conditioning, satellite TV with flat screen, WI-FI fiber, direct dial telephone, private bathroom with hairdryer, shower or bathtub and complimentary toiletries. A mini-bar is available on request. Two-room apartments are available with balcony with side sea view, equipped kitchenette with fridge, WI-FI, satellite TV, air conditioning, weekly bed linen, bathroom and kitchen. Garden with swimming pool, hydromassage, wellness area, free bicycles, open-air porch, panoramic rooms, reading room, lift, 24-hour reception with bar and safety deposit boxes. On request beach towel in use and late check out service. The hotel organizes theme nights and is equipped for cyclists. PARKING: available uncovered parking spaces, subject to charges. AIR CONDITIONING: fully air-conditioned without additional costs. PETS: allowed - with the exception of the restaurant. A trusted veterinarian with a clinic near the hotel is available. BREAKFAST: sweet and savory, served on the sixth floor with a panoramic view. LUNCH AND DINNER: buffet, with local and international recipes based on meat and fish. To accompany the various dishes, the chef offers local organic wine and a wide selection of autochthonous wines. VARIATIONS: vegetarian alternatives are available. In hotel: outdoor playground area, strollers, baby pool, live entertainment, baby / mini club, pediatrician and baby sitter on request. The hotel offers its guests a swimming pool surrounded by greenery with a counter-current swimming area, hydromassage area, water games and baby area. Guests have access to a wellness area with sauna, hydromassage, thermal bath and air bed. Possibility to receive regenerating and toning massages. The hotel has an agreement with the Bagno Lele beach n. 8 equipped with entertainment, sports fields, swimming pool, mini club, baby changing room and fitness area. Rates starting from € 50.00 per person per day in All Inclusive formula. Promotions Children FREE (check availability at the time of booking) Low Season periods. Offer in formula Full board starting from € 50.00 per person per day. Soft Open Bar: 24-hour dispenser in the bar and restaurant. Stay in one of these bridges and book for the summer ... for you an extra 5% discount on the summer vacation. Also this year we promote the 2019 Early Booking: 2018 blocked prices + additional 10% discount if you book before March 31st!